The 9th recording of our Basic Love Energy Techniques is now available. This amazingly unique recording teaches you to activate a Merkaba and to bilocate to the safety of our 23 acre/9 hectare Love Energy Sanctuary so you may self help and self heal yourself in the comfort of your home. Our recording begins with ancient and modern wisdom about karmic ties and energetic attachments. Then, a special Karma Transfer Ceremony activates the stored Unconditional Love Energies of Joy, Bliss and Beyond Bliss as well as the self help and self healing instructions we deposited into each set of 3 Healing Crystals during our Love Energizing Ceremonies. 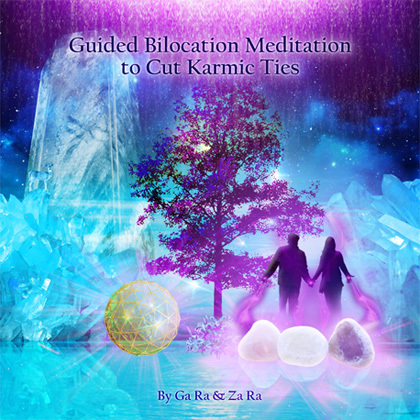 Next, using help from one’s 3 Healing Crystals, one activates a Merkaba and bilocates to our Love Energy Sanctuary where 100 Healing Crystal Spheres assist one to cut karmic ties and sever energetic attachments. This amazing recording offers one the wondrous opportunity to accomplish many things including healing one’s memories of prior lifetimes that are recorded in the Mind of one’s permanent Emotional Body. This process enables one to repay karmic debts from past lifetimes, as well as this lifetime, and to pass spiritual tests in this lifetime, so one may enjoy the energies of happiness and Joy in one’s daily life. A download of our 2 hour Guided Bilocation Meditation recording and 3 Unconditional Love Energized “Seer Stones” is $39 plus shipping. Two CDs of the 2 hour recording and the 3 Unconditional Love Energized “Seer Stones” are $49 plus shipping. Please note that if you are purchasing a download, the 3 Healing Crystals to be used will be mailed to you within 3 working days. Please wait for their arrival before you listen to the Bilocation Meditation.